Potted plants require diligent care to thrive in a confined growing environment. Placing an evergreen into a pot is no different. Gardeners frequently use potted spruce trees as accent plants besides entryways and on patios as beautiful outdoor decorations. Learning how to care for spruce trees in pots involves careful choice of the container, planting with appropriate potting medium, and continued monitoring of soil moisture. Potted trees also require regular fertilizing to promote healthy growth. Finally, gardeners need to make the decision when to move the plant out of the pot into the garden environment for continued health of the plant. Flip the large pot over to check for drainage holes in the bottom of the planter. Drainage holes should be spaced every 4 to 5 inches along the bottom of the pot to prevent water from pooling inside the planter. Punch additional holes if needed into the bottom of the pot using a screwdriver and hammer. Electric drills also work well to poke holes into the bottom of thick pots. Position the container in a permanent location to avoid having to move the heavy planter. Slip the rolling plant tray under the pot before adding rocks or dirt to the container. Add a 4-inch layer of gravel to the bottom of the pot to add weight to the planter. Remember the spruce will extend high above the pot rim and will be top heavy. The rocks stabilize the pot but also make the container extremely difficult to move. Fill the planter halfway full with new potting soil. Carefully roll the spruce onto its side to remove the plastic growing container. Slice straight down (don't press deeply) with the utility knife to open one side. Pull the plastic apart and peel the container from around the spruce's root ball. Dig your fingers gently into the soil around the root ball to free compacted roots. Since the plant will be residing in a container, don’t encourage outward growth by loosening the roots too much. Simply give the roots a little breathing room before placing the plant in the new container. Lift the plant into the container to measure positioning with the pot rim. The top of the root ball should lie about 4 to 6 inches below the pot rim. This allows room to place a soil and mulch layer solidly on top of the root ball. Adjust the potting soil level as needed and position the tree centered in the pot. Fill in around the spruce with loose potting soil and compress the soil regularly to firm it around the root ball. Bring the soil level to 4 inches below the pot rim. Add a 2- to 3-inch layer of mulch to the top surface of the soil. Water the spruce at the center near the trunk. Deep watering allows a slow to moderate drip of water to seep into the pot. Slow irrigation disperses water throughout the planter for even distribution of moisture. Check the spruce tree regularly throughout the growing season to monitor soil moisture levels. Water immediately if you can feel dry soil to a depth of 2 inches in the pot. Fertilize with a high-quality, slow-release fertilizer at regular intervals during the growing season to add nutrients to the potting soil. 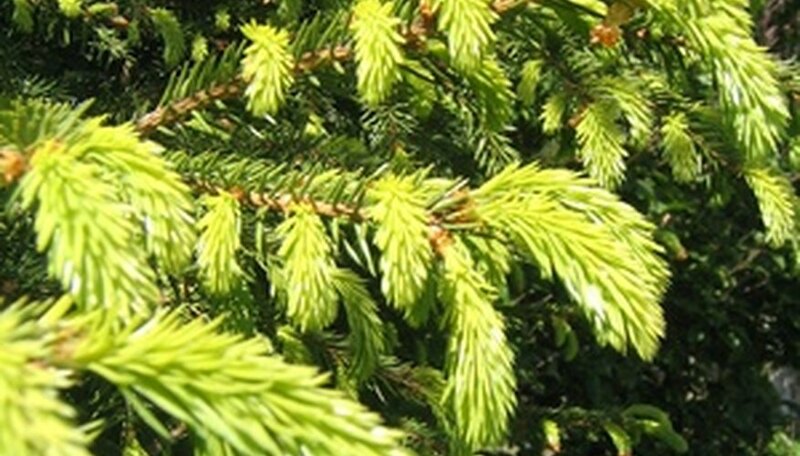 Protect the spruce tree in cold weather by placing the plant in a protected location. If possible, move the plant off of a raised deck since cold air will circulate around the entire plant. Tuck the pot against the house and wrap the plant in bubble wrap or plastic for the winter. Continue watering when soil becomes dry. What Kind of Pine Trees Are Good in Containers?